Rabbit was not big like some animals. Rabbit was not strong. But Rabbit was smart. But Rabbit wanted to be WISE. "Sky God," called Rabbit. "Please give me wisdom. Make me wiser than all other animals and people." "I will give you wisdom, little Rabbit, only if you can do three things. First, bring me scales from the Big Fish that lives deep in the sea." Sky God knew Rabbit could not swim. So this was an impossible task. "Second, bring me a bucket of milk from the Wild Cow." Sky God knew that Wild Cow was to wild and too fast to ever be milked. So this was an impossible task. "Third, bring me a tooth from the Angry Leopard." Sky God knew that Angry Leopard was too fierce to ever let any animal take one of its teeth. So this was an impossible task. Rabbit believed that nothing was impossible if one tried long enough and hard enough. So he went out to do the three tasks. 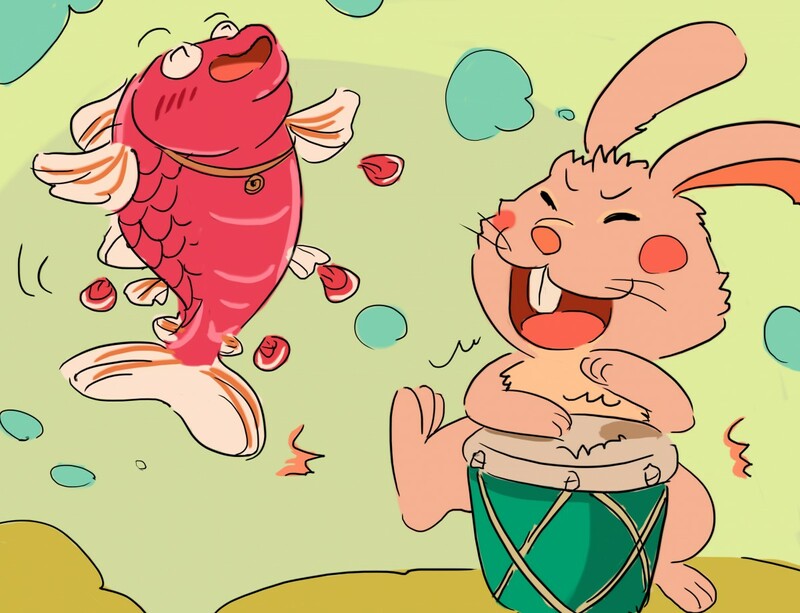 First Rabbit went to the sea shore where Big Fish lived. He took a drum and began to beat a rhythm. Big Fish heard the drum beat. He came to the surface to listen. Soon, Big Fish climbed out onto the sand and stood on his tail. He began to dance. He whirled and danced so fast that part of his scales fell off. Rabbit stopped playing. Big fish jumped back into the sea. Rabbit picked up the scales. He had done the first task. Then Rabbit went to find Wild Cow. "You are so wild and so funny," called Rabbit. "I will show you who is funny," said Wild Cow. Cow lowered her horns and ran at Rabbit. Rabbit ducked behind a tree. Wild Cow hit the tree, and her horns became stuck. Before Wild Cow could get free, Rabbit ran around the tree and milked her. He had done the second task. Rabbit then walked to the path where Angry Leopard walked every day. The top of the path ran down a hill. Rabbit dropped part of the fish scales and spilled some of the milk at the top of the hill. Then he hid behind a rock at the bottom of the hill. Angry Leopard came walking over the top of the hill along his path. Slip - Bang! Angry Leopard slipped on the scales and the milk and rolled down the hill. He hit his face on the rock and lost a tooth. Rabbit picked up the tooth and ran away quickly. He had done the third task. Rabbit called to Sky God. "Sky God, I have done your three tasks. Now give me the wisdom you promised me." Sky God kept his promise. He gave Rabbit wisdom. Now rabbit was smart and wise. He always had enough wisdom to never go near Big Fish, Wild Cow and Angry Leopard.